Insert pithy quote about reaping and sowing here. The anti-spending zealots don’t care what the spending is on. There is only one budget category as far as they’re concerned, and that category is Spending. They want less of it, full stop. 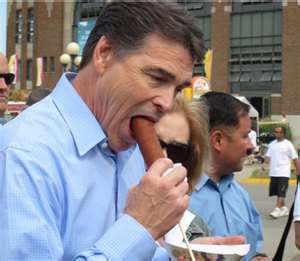 Rick Perry is well aware of this, and has freely used that language when the purpose has suited him. The fact that he is now at cross purposes with these marauders just shows how far out they are. Williams said he and House Appropriations Chairman Jim Pitts, R-Waxahachie, sent a letter to the Journal disputing the facts behind the paper’s editorial. The Journal is expected to publish the letter in the coming days, according to Williams’ spokesman, Gary Scharrer. The editorial claimed lawmakers increased spending 26 percent from the previous session, citing figures from the Texas Public Policy Foundation, an influential conservative group. Lawmakers have described TPPF’s figures as misleading and manipulative. “I’ve got a bellyful of people that are using their organization to criticize the work that we do here so they can raise money to pay their own salaries,” Williams said, referring to TPPF. According to the nonpartisan Legislative Budget Board, lawmakers approved a two-year budget that increases total spending by $7 billion, or 3.7 percent. State spending would increase $7.2 billion, or 8.3 percent. Yes, the TPPF are a bunch of lying hacks – film at 11. Williams’ zinger is dead on. There’s no other organization in the state that funnels so much money to so many people with so little talent and so few useful skills. (Marc Levin, who does criminal justice policy for the TPPF, is an honorable exception.) You have to wonder how many of them could survive in the real world. “We stand by our numbers, and are happy to explain them in-depth to anyone who wishes,” TPPF spokesman Joshua Treviño said Wednesday. Josh, old buddy. How are things in Malaysia these days. If he tells you that two plus two is four, I’d advise asking him who’s paying him to say that. Anyway. It’s hilarious seeing Perry getting slapped by these clowns, who are usually his bros – it’s basically the wingnut version of “Heathers”. It’s just a shame anyone takes them seriously in the first place. Texas Politics and EoW have more. Pro tip: If your organization hires Josh Trevino to flack for you, you’ve already created a trust deficit.